I am thrilled to have Rachel Sussman, who just gave a talk at TED Global, as our next CreativeMornings speaker. Rachel is on a mission to identify, find and photograph the oldest living things in the world. For the past 5 years she has been researching, working with biologists, and traveling all over the world to find continuously living organisms that are 2,000 years old and older. This month’s event will be hosted by the generous folks over at the amazing Galapagos Art Space in DUMBO. If you are not familiar with the space, get ready for a real treat. R.S.V.P will open at noon monday august 23, 2010 over at creativemornings.eventbrite.com! Please let us know if you r.s.v.p’d but can no longer make it. Our events fill up quickly and we usually keep a waiting list. Thank you! And at the morning of the event, make sure to put on your chatty networking hats! Breakfast will be generously sponsored by our main sponsor MailChimp and this month’s co-sponsor Edition29. Edition29 ARCHITECTURE is a visually stunning collectable iPad magazine App that focuses on showcasing the new generation of modernist architects and their creations through cinematic photographic storytelling. Watch the Video. CreativeMornings is a monthly morning gathering of creative types. Each event includes a 20 minute lecture, followed by a 20 minute group discussion. The gathering begins at 8:30am with the topic presentation starting at 9:00am and everyone taking off for work at 10am. CreativeMornings are free of charge! 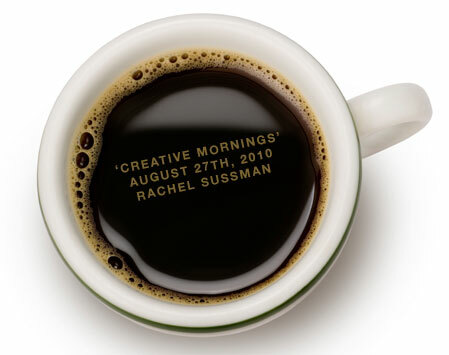 Be the first to know when r.s.v.p’s open up, follow CreativeMornings on twitter! Check out pictures of previous CreativeMornings over at Flickr. View all the taped CreativeMorning talks we’ve put up on the web so far over at Vimeo.